If your work involves standing or walking for long hours on flat hard surfaces then your feet can start to suffer problems such as over pronation. It is estimated that 65% of the population experience foot ailments and it is all due to the hard flat artificial surfaces we run, walk and stand upon every day. These artificial surfaces and not like the surfaces that exist in nature that humans evolved to walk upon. Walk along sand or on grass or soil and you will notice that the ground seems to mold to your feet, it is soft and absorbs your weight easily. Now walk on concrete and you will find that the force of your weight hitting the ground gets redirected upwards into your ligaments and joints as the ground doesn’t mold to your feet instead it is rigid, stubborn and hard and it is causing damage to your feet. These hard surfaces can cause over-pronation which leads to heel inflammation and can also lead to knee and back pain as your posture readjusts to distribute your weight away from the foot. Over-pronation fortunately can be corrected with the use of arch support insoles. Arch support insoles absorb shocks from the ground as you walk, support your feet in a natural position and correct your posture. Whilst orthotics can be expensive it is a good investment because they help to prevent injuries and pain caused by bio-mechanical problems in the future. It is said that prevention is much better than the cure and this is certainly true for arch support insoles as they prevent problems from occurring in the foot and can help your feet to start repairing themselves as they are no longer inflamed and as swollen as they were before. Existing pain is also relieved with the use of arch support insoles. NuovaHealth source only the best quality arch support insoles to fit all your needs. They can be cut down to the exact size you require ensuring a comfy fit for your favorite pair of shoes. Try our arch support insoles today – year long guarantee applies to all our products meaning if you are not happy you can return them for a full refund, no questions asked. Below you will find a list of the very best arch supporting insoles that can be used to prevent and treat a wide number of different foot, leg, knee, hip and back problems. First to feature on our list are our Arch Support Insoles for Plantar Fasciitis and Flat Feet. These insoles have been constructed using carbon fiber in a rigid contoured plastic shell to support and protect your feet from damage and ease pain. They are the perfect choice for those with flat feet and high arches who are more susceptible to developing foot injuries such as plantar fasciitis. This is because they are designed to help correct bio-mechanical imbalances and help improve the way your foot functions. The rigid arch support also helps to take pressure off your arch and prevent your feet from over pronating or under pronation when you walk. These insoles are ideal of runners and athletes due to the fact these insoles are made from carbon fiber means making them extremely lightweight and durable plus you can trim them to size quickly and easily to fit inside even the narrowest running shoes. These insoles come with a full 30 day money back guarantee, this means if the insoles fail to ease your foot pain or they are simply not for you then you are able to send them back within 30 days of receiving them and you will get a full refund! Rigid inbuilt arch support helps to keep your feet supported and injury free. Corrects pronation in your feet (excessive pronation is linked to a number of different foot and lower limb injuries). Can be worn to help treat a number of foot and lower limb injuries including but not limited to Plantar fasciitis, Achilles tendonitis, Metatarsalgia, Morton’s Neuroma, Shins splints, Runners knee and Jumpers knee. Designed to efficiently absorb shock and spread pressure evenly across the heel and foot making these insoles ideal if you are on your feet for long periods or you are an active runner. Available in different shoe sizes 3-7 and 7-11, can also be trimmed to the right size and shape. 3/4 Semi rigid plastic heel cup shell helps to improve support and comfort around your heel. Treated Active anti bacterial carbon fiber to prevent odor and the build up of bacteria keeping your feet feeling fresher for longer. These insoles will provide you the best arch support if you have flat feet. If you have flat feet then you are more prone to foot pain and injury. This is because you are more likely to develop excessive pronation which can lead to abnormal load and pressure on your arches. Featuring advanced orthotic compression support which has been proven to help treat and prevent plantar fasciitis. Plantar fasciitis is a very common foot injury that you can get if you have flat feet. Plantar fasciitis is caused when the plantar fascia ligament that supports your arch becomes damaged and inflamed. Plantar fasciitis can lead to foot and heel pain and left untreated can become chronic. 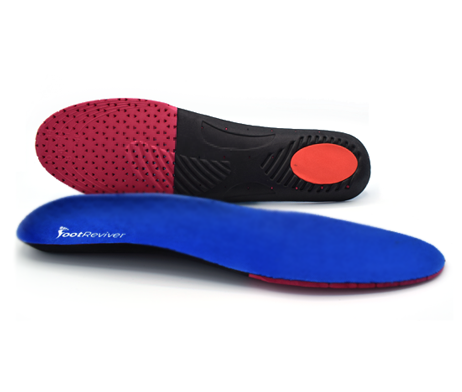 Wearing a pair of Footreviver insoles in your shoes will stop your feet from over-pronating and will take pressure off your arches and stop you from getting injuries such as plantar fasciitis. Using Footreviver own patented arch support technology these insoles will keep your feet injury free and feeling super comfortable in your shoes! Available in a number of different shoe sizes! 30 day money back guarantee means you have nothing to lose when purchasing. Are you on your feet all day and often suffer from foot and heel pain? If you do then you might want to try wearing a pair of these insoles. 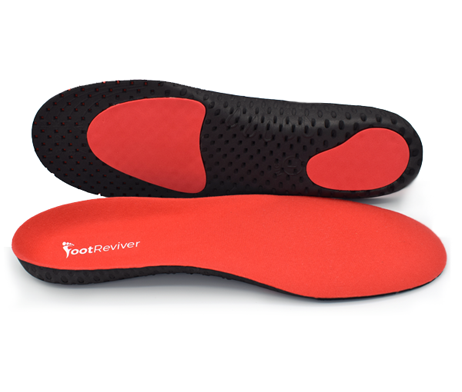 These insoles have been cleverly created by the foot experts at FootReviver to help ease foot pain and injury using orthotic compression and support! With FootReviver’s own patented orthotic technology these insoles will help to keep your feet supported in the correct position and will help to prevent damaging pressure building up underneath your soles and injuring your feet. Not only will these insoles help to treat and prevent injury but they will also help to keep your feet feeling super fresh inside your shoes, this is thanks to the many breathable holes located on them. Rigid inbuilt arch support corrects the way that your foot functions, this in turn helps to reduce strain and pressure on your feet preventing injuries from developing. Made from shock absorbing EVA that stops shock related injuries such as shin splints and runners knee. Breathable holes help to circulate air around your feet keeping them dry, bacteria free and feeling as fresher for longer! Heel cup gives your heels Superior heel support reducing pressure on your heels helping to stop heel spurs and heel pain. Motion control technology helps to correct your gait and stop you from straining your feet when you walk or run. Ergonomically designed to spread pressure and stop pressure building up underneath your soles to help eases foot pain and heel pain. If you want to give your arches extra support and protection around the house without wearing shoes then we would highly recommend picking up a pair of these foot supports. They work by using a cushion pad that straps around your foot supporting your arch and protecting your foot from shock without the need of wearing shoes. Bio-mechanical and functional imbalances such as over pronation during the gait cycle can cause abnormal load and pressure on your feet triggering injuries such as plantar fasciitis. The cushion pad will help to hold your foot in a natural position when you walk stopping your foot from excessively pronating. Not only will a pair these foot supports help to take strain and pressure off your arches but they will also help to support and protect the balls of your feet easing ball of foot pain. Please note that these insoles will need to be regularly replaced every 2-3 months depending upon how often you wear them to ensure that your feet get the best support and protection. Light weight and discrete. Most people forget that they are wearing them! Ideal for treating injuries such as plantar fasciitis and metatarsalgia (also known as ball of foot pain). 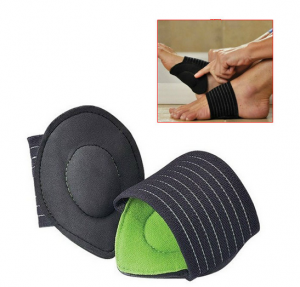 Cushion pad supports and protects your arch and ball of foot from shock and strain. Motion control orthotic compression prevents your foot from pronating excessively. These gel insoles adapt to the contours and shape of your feet to provide you with a custom level of protection. These massaging gel insoles will actively massage your feet and are ideal for runners, athletes and people who find themselves on their feet for long periods of the day. These insoels will help to combat against foot aches, fatigue and pain and thanks to their enhanced shock absorbing properties they will also help to prevent shock causing pain and injury in your lower legs, knees, hips and back. Wearing these insoles inside your shoes has been proven to be better for your feet than wearing more expensive custom insoles. Unlike custom insoles these insoles position and support your feet in a more natural and correct position whilst custom insoles are made from a cast of your feet and will only ever support your feet in that position which was causing you problems. Available in shoe sizes 6-9 and 8-12. Treated with an anti bacterial formula to prevent foot odor and lowering risk of infections. Made from durable silicone gel that lasts longer than other insoles providing your feet sustained support and protection. Massages and adapts to the changing shape and contours of your feet as you walk for the best possible comfort. Supports arch, forefoot, ball of feet, heel and Achilles tendon. Perfect for those who suffer from flat feet or high arches. Corrects pronation and other imbalances that can cause injury and pain. Next on our list are these shock absorbing insoles that have been made with runners in mind! They will help to absorb shock and keep your feet and lower limbs fully protected. Wearing shock absorbing insoles is important if you are a runner and run on hard surfaces. This is because running on hard surfaces can cause severe damage to key parts of your foot such as your plantar fascia making you more prone to developing injuries such as plantar fasciitis. If you have already developed a foot injury such as plantar fasciitis your feet will not be able to function properly. This can affect your foots ability to absorb shock which can make you even more prone to further damage and your plantar fasciitis getting worse. These insoles have been made specially to absorb as much shock as possible and the memory foam top layer will stop pressure from building up underneath by evenly spread this pressure around your foot to prevent damage and ease foot aches, pain and reduce fatigue. 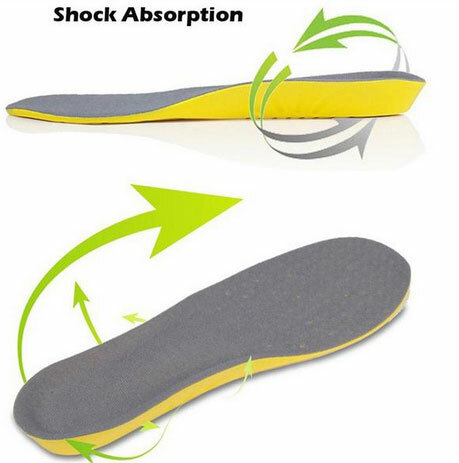 Not only will these insoles help to protect your feet form harmful shock but they will also help to support your arch. The inbuilt arch support that they have will keep strain off your arches when you walk or run and will help to correct the most common functional and bio-mechanical imbalances from occurring. 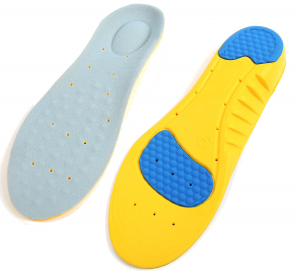 These insoles are extremely lightweight and have been designed with breathable holes that help to better circulate air around your feet keeping your feet as fresh as possible. Super light weight and flexible design makes these an ideal choice for runners wanting to avoid injury. Hard shell design helps to stop shock in its track allowing you to run on hard surfaces without any problems. Inbuilt arch support keeps your feet in the correct position and stops strain and overt stretching. Metatarsal pads help to prevent and treat metatarsalgia! Ideal for people suffering from Plantar fasciitis, Achilles tendonitis, Ball of foot pain, Morton’s neuroma, Shins splints, and knee problems. Last on our list comes these premium sports insoles. These insoles are great if you play a lot of sport or just simply on your feet for long periods. They have been made with the very best light weight and shock absorbing materials. The inbuilt arch support is extremely rigid giving your feet a lot of support and protection in the places that they need it the most such as the tarsal and metatarsal bones as well as the supporting longitudinal (medial and lateral) transverse arch ligaments. If you are suffering from plantar fasciitis these insoles are ideal for treating a number of different biomechanical and foot function conditions that can contribute to plantar fasciitis. 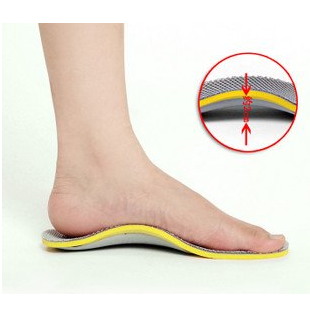 By getting rid of these underlining causes and by taking strain and pressure off your arches these insoles will help your feet to heal properly allowing for you to make a full and speedy recovery. Available in a number of shoe sizes. Inbuilt arch support helps to correct the way that your feet function as well as helping to take strain and pressure off your plantar fascia and metatarsal bones. Memory foam and shock absorbing base stops shock from damaging your lower limbs and makes your feet fell extremely comfortable. Heel cup and heel grip technology improves stability in your heels and ankle stopping your feet from moving and around and helping you to avoid sprains and strains to the Achilles tendon. Helps to reduce aches and fatigue. Metatarsal pads help to better support your metatarsal bones, toes and forefoot better helping to treat and prevent injuries such as Metatarsalgia, Bunions and Morton’s neuroma. Breathable holes help keep your feet dry and feeling fresher for longer when running and playing sports. I do lots of running but my feet get really sore after a while because I have flat feet will these insoles help me? Running can put huge strain on your feet.. if you have flat feet this strain can often be magnified and can lead to the development of overuse injuries like plantar fasciitis. That is why it is good to wear some supportive insoles inside your running shoes. we would suggest getting a pair of our NuovaHealth arch support insoles found above. These insoles will help to take strain off your flat feet when you run. They are super lightweight and will fit nicely inside your running shoes. If you find that they do not help with your curing your sore feet you can always return them within 30 days to get a full refund. I am thinking about buying the gel ones? Are they any good/just as good for supporting flat feet as the other ones? Yes! 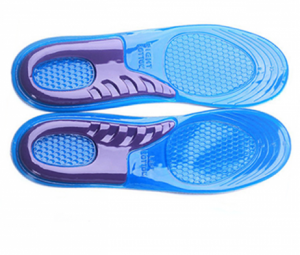 If you have flat feet the gel insoles will provide adequate support and protection. They will adapt and mold to the shape and contours of your feet and use orthotic compression to realign and adjust your feet into the correct position eliminating strain and pressure from causing damage. They are a perfect choice for people who are on their feet for long period or who do a lot of sporting activities such as running or playing football. I have over pronation when I walk, will any of these insoles help correct the way that I walk? Also How long will they last me as I have bought orthopedics in the past from other places and they have literally worn out after a week of wearing them in my shoes!